memories. CLICK HERE or the image to the right for the flyer. 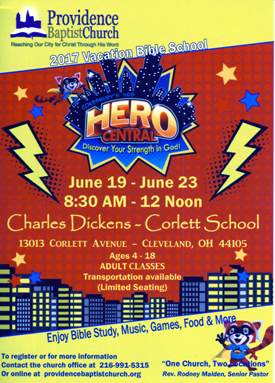 This year the theme is ‘HERO CENTRAL- Discover Your Strength in God’ and the team has prepared a very engaging, fun and educational week for children, youth, teenagers and adults. This year’s DVBS runs from Monday June 19th through Friday June 23rd. Lunch is provided. DVBS is free, but you do have to register. Providence church office at 216.991.5315. DVBS is held at Charles Dickens Elementary School located at 13013 Corlett Avenue, Cleveland, Ohio 44105. 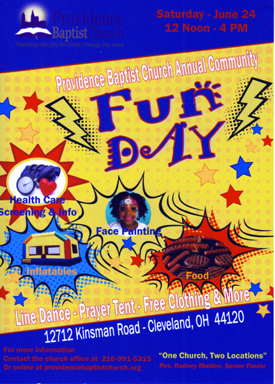 This free event features food, line dancing, games, fellowship and fun! Please come out to join us and make this another memorable Community Day! You can CLICK HERE or click on the image to the right for the flyer.